The Right to Education Project is pleased to invite you to participate in a discussion on monitoring the right to education using indicators, following the recent launch of the Right to Education Project (RTE) new online Guide to Monitoring the Right to Education (‘Guide’) and accompanying Right to Education Indicators Selection Tool (‘Tool’). 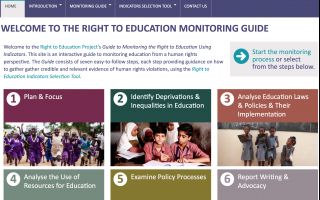 We have produced the Guide and Tool to demystify and simplify the monitoring process and help all those engaging in education advocacy to gather credible and relevant evidence using human rights indicators which can then be used as a basis upon which to advocate for change, in line with human rights law and principles. The Tool, Guide and list of indicators are works in progress. Our aim is to work with civil society organisations and academics to make them as robust and useful as possible. In the coming months, we will improve and develop the list of indicators, focusing on specific aspects of the right to education. We would like to take advantage of CIES to present the Guide and Tool and discuss further research with experts. We hope you will be able to join us to share your feedback and ideas. The event will be held on Monday March 7th, from 4.45pm to 6:15pm in Room 854 of the Sheraton Vancouver Wall Centre Hotel, Vancouver. RTE’s Advisers Salim Vally and Keith Lewin will participate in the discussion. Further information about the Guide and Tool in our blog post which can be found here.